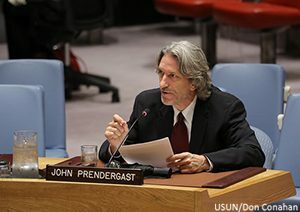 John Prendergast, Founding Director of the Enough Project and Co-founder of The Sentry, briefed (Français, العربية) Security Council members on the urgent need for the international community to take action to address this crisis. Specifically, he described how the powerful tools of leverage such as network sanctions, anti-money laundering measures, and prosecutions by the International Criminal Court and other courts can change the incentive structure for the violent kleptocrats that cling to power while exploiting their countries’ natural resources and financial assets for self-enrichment. In attendance were representatives from the United States, the United Kingdom, France, Kazakhstan, Côte D’Ivoire, the Netherlands, Sweden, the Russian Federation, Peru, Bolivia, Kuwait, Equatorial Guinea, Poland, and Ethiopia. Want to take action? Help amplify this message and let members of the Security Council know that activists around the world want to break the links between conflict and corruption.